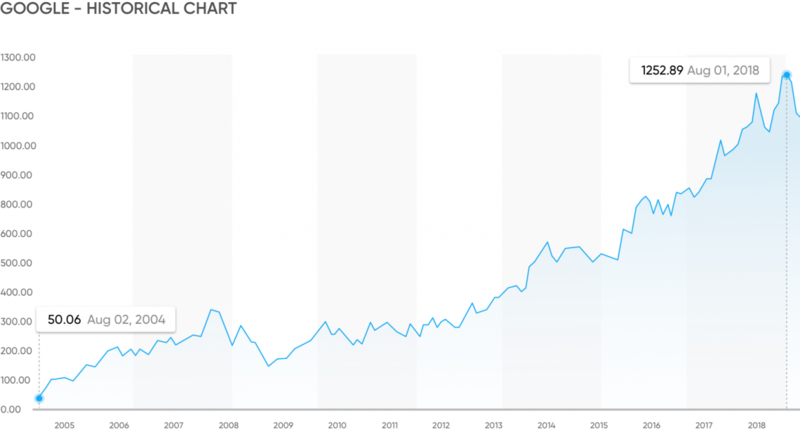 ﻿ Google share price history – should you buy GOOGL in 2019? Google share price history – should you buy GOOGL in 2019? For traders News and features Features Google share price history – should you buy GOOGL in 2019? If we want to know something, we most often Google it. Google has become the quickest source of information, delivering more data than you could ask for in a matter of seconds. One of the world’s most popular technology companies, Google serves as a top-traded stock! We ask: should you invest in GOOGL this year? Well, we all know Google. Actually, most of us use it every day. Google is owned by holding company Alphabet after the company restructured its operations in 2015. So when we think of Google share trading, we actually mean Alphabet trading. Google was founded in 1998 by Sergey Brin and Larry Page, when the two roommates at Stanford University started a business that would become a multinational technology corporation. The company specialises in internet-related services and products, including its world-famous search engine, the Android operating system and advertising. Today, Alphabet operates a series of side projects, including driverless cars, anti-aging products and glucose-sensing contact lenses. A company, building and designing urban innovations, reimagining city life. What do we know about Google performance? On the historic day of 19 August 2004, Google went public. The company’s initial public offering (IPO) was priced at $85 per share. The current price of an Alphabet share is $1,140 (as of 5 February 2019). Let’s assume you invested $1,000 in Google in 2004 at the IPO price. Today, your investment would be worth $12,540! And that’s only for the 11 shares! Just imagine if you had bought 100 shares. Do you regret the missed opportunities? Cheer up. Google share price history proves it is still worth trading. Should you buy GOOGL shares right now? In summer 2018, Alphabet (GOOGL) stock reached its all-time high of $1,285.09 and rose more than 30% in 2017. The history of Google stock shows that the company’s all-time low of $47.67 occurred in July 2004. Feel the difference! Speaking about Alphabet’s (GOOGL) stock prospects for 2019, analysts predict it should be considered as a strong buy. According to the 12-month forecast, offered by the 40 experts, Google shares have a median target of $1,355.00 (with a low estimate of $1,150.00 and a high estimate of $1,500.00). Therefore, if you’re looking for a stock with a potentially good return, Alphabet can be an attractive investment option. Well, yes. Google share price history looks really positive, consistently making GOOGL an investor pick. However, Alphabet’s shares are definitely pricey today and probably unattainable for the majority of small investors through traditional share trading. Still, there is always a good alternative – contracts for difference, or CFDs. 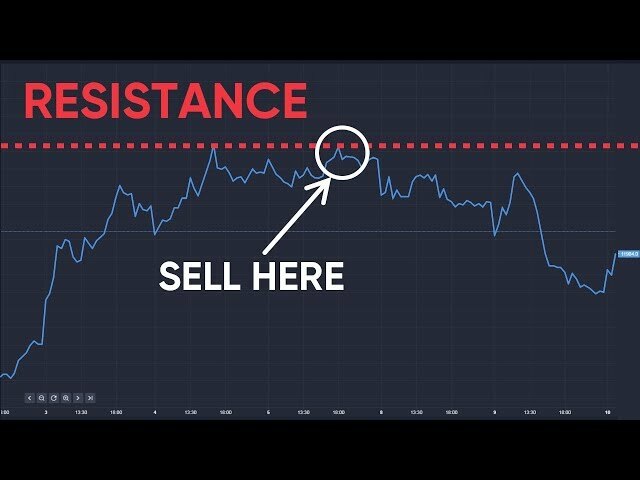 How to trade Google CFDs? If you can’t afford to buy Google shares, or simply don’t want to make a long-term investment, you can choose contracts for difference and speculate on the price difference of GOOGL stock without actually buying it. A CFD is a very flexible instrument, providing you with an opportunity to trade regardless of the market’s price direction. You are free to open a long position (predicting the price will go up) or a short position (speculating the price will fall down). Unlike traditional Google share trading, CFDs are considered short-term investments that can bring you quick profit. That being said, never forget that trading is always risky. Another major difference of trading CFDs versus buying shares is leverage. Contracts for difference are leveraged products, i.e. you can trade on margin provided by your broker and open larger positions with limited funds. As it turns out, Google has become so much bigger than just a popular search engine. Today, it’s hard to imagine what will be their next venture will be, but we’ll definitely hear from the hi-tech giant in the years ahead. The name Google originated from a play of the word "googol," a mathematical term, which refers to 1 followed by 100 zeros. Google’s parent company Alphabet employes 94,372 people (as of 2018). According to statistical data, Google owns 90.28% of the world’s market share of search engines (as of 2018). On average, Google has been acquiring one company a week since 2010. The first Google Doodle came out on 30 August 1998. It was a Burning Man stick figure. 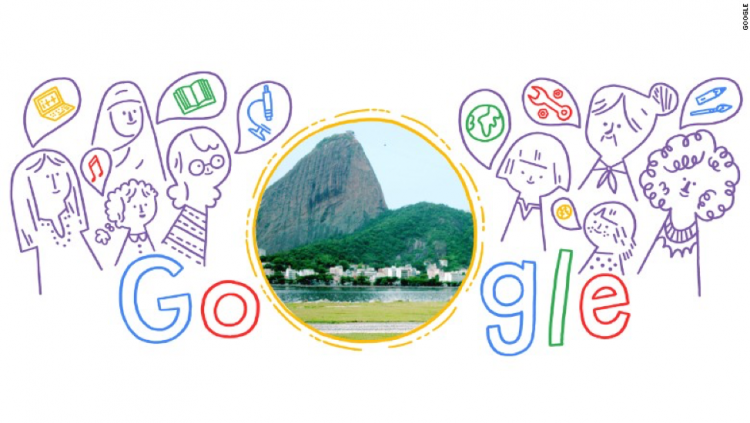 Since then, the creators of Google Doodles have been gathering hundreds of animations and illustrations every year for display on its homepage.